Rockwall-Heath Hawks | Rockwall Rocks! Tied 7-7 at halftime, Rockwall-Heath’s offense finally broke open a close game by scoring 19 points in the second half, while the Hawks’ defense limited Arlington Seguin to just three points, and Heath defeated a stubborn Seguin team, 26-10, in a tough home opener Friday night at Rockwall’s Wilkerson-Sanders stadium. Kendial Lawerence ran for 112 yards and four touchdowns in just the first quarter Friday night as Rockwall-Heath (9-0, 6-0) jumped out to a 37-0 lead on its way to demolishing Carrollton R.L. Turner (1-8, 0-6) in a District 10-4A game at Carrollton Standridge Stadium. Lawerence carried the ball just seven times before sitting out the last three quarters. 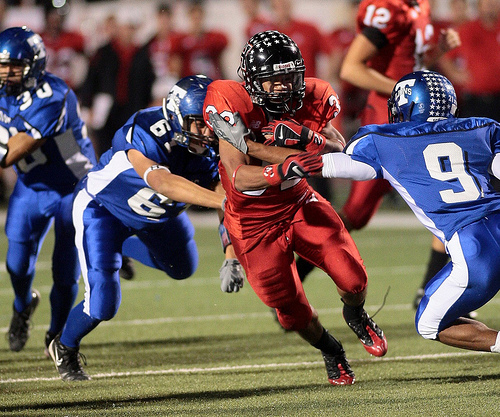 He now has 30 touchdowns for the season, and is the leading scorer in District 10-4A. The Heath defense, led by linebackers Austin Moss and Ryan Mosby, allowed just 33 total rushing yards and 24 passing yards to Turner’s offense, plus only two first downs.